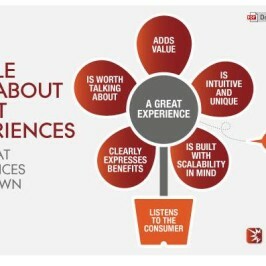 What contributes to a great customer experience? Is it something inherent in the Product/Service or is it something created with effort over time ?How does the business achieve this ?Customers make future buying decisions based on their experiences with the Brand. A Brand/Business need to create great customer experiences to achieve business growth and brand equity. According to a research conducted by Ignition Network, the base factor for a great customer experience lies in listening to the customer. Customer needs to feel cared for and attended to. Customer experiences are grown out thereafter based on many other factors like the branches of a tree growing out of the root. These include product/service bringing benefit to the customer, adding value, being intuitive and unique, scalable and worth talking about.These will lead to a great experience – something which will be shared by the customer with others, thereby helping your business grow. Being able to get a continuous feedback, listening to customers and taking action on the inputs would help you to regenerate the branches of your business tree..
How do you achieve a continuous flow of such feedback from customers? GladMinds Connect Platform is an example of mechanism that allows you to be in touch with your customers in an easy and simple way and thereby enable Great Customer Experiences to be created.